One of the best things about working for a small agency is the opportunity to wear many hats. On any given day, an Array team member could be a designer, project manager, stylist, puppy wrangler… you get the idea! 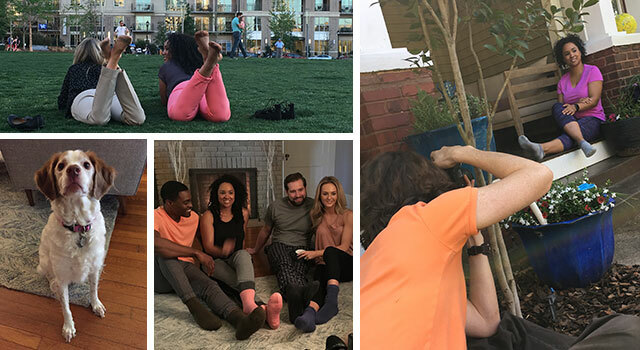 This past week, Eric, Cathy and Tara had the opportunity to direct a photo shoot in Charlotte, NC for our valued client Interloop North America. Interloop has a vast breadth of experience in the hosiery industry. 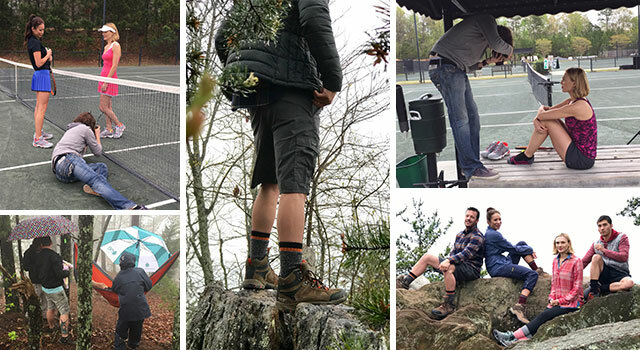 With the recent ecommerce launch of thecomfortsock.com (of which Array was integral in designing and planning), Interloop was in need of lifestyle photography featuring their product – socks! The Comfort Sock is Interloop’s flagship brand, offering products with innovation, comfort and style. 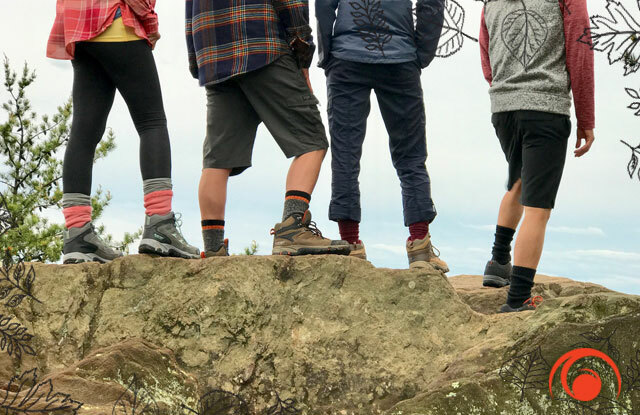 Partnering with a variety of other industry brands, Interloop also licenses performance and stylish socks for Hi-Tec, Prince, Magnum and Berkshire. With multiple sock brands under The Comfort Sock umbrella, a photoshoot for all five brands was going to be quite the task. But as always, Array was up for the challenge! After months of planning and coordinating with Charlotte local Sean Busher Imagery, an aggressive three-day shoot was set for early spring. Working together for the first time, Sean’s artistic approach really helped Array’s vision come to life, capturing both photography stills and motion video. Even though we were to have wonderful talent on set, at the end of the day, the product was to be the hero. DAY 1 – MAGNUM: Magnum socks meet the performance needs of professionals working in high pressure environments. Array hoped to create a construction scene, but after failing to locate a site (and with impending inclement weather) we opted to book Sean’s studio. We had decided to utilize CGI in post-production to replicate a work environment. But on the day of the shoot, Sean’s production team happened upon an active worksite that granted us permission to shoot. With a little bit of accidental luck, we walked away with an authentic construction scene! DAY 2 – THE COMFORT SOCK: With something for everyone, The Comfort Sock offers support, cushion and impeccable fit for the utmost comfort. Our objective was to capture the dual functionality of The Comfort Sock: for athletic performance or everyday comfort. In a quaint neighborhood right on the outskirts of town, we set up for the morning in Sean’s single-story cottage style home with which he graciously offered up for the shoot. With relaxing captures from the deck and hammock in the sunny backyard, to the active jogging and stretching shots in the front lawn, we achieved the right The Comfort Sock blend. Eric’s pup Riley even had a cameo! BERKSHIRE: From day to night, Berkshire is the fashion-forward, supportive sock made for every shape and size woman. With uptown Charlotte as our muse, we aimed to capture the essence of city chic, grabbing shots along benches, alleyways and park commons. On paper, multiple locations with wardrobe changes sounded ideal. But in reality, we really worked for our shots, lugging carts full of photography equipment, prop bags and a full garment rack across town – urban trekking at its finest! Our models took everything in stride (literally!) making sure their socks were the star of the show. DAY 3 – PRINCE: Inspired by professional tennis athletes who demand a lot from their socks, the Prince brand exceeds standards of excellence. We envisioned a scene that demonstrated performance on or off the court. The Palisades Country Club, with its New England style clubhouse, clay courts and outlying pines provided the perfect backdrop for our tennis scene. We learned a thing or two about the ins and outs of the sport and even had a bit of fun with our talent who may have lacked the tennis gene. HI-TEC: The Hi-Tec brand enjoys recognition as being one of the world leaders in sports and outdoor footwear. For us, the only way to portray performance was to have an adventure ourselves. So, we headed to the mountains for the authentic experience. Despite the torrential rain, wind, thunder and lightning, the entire team braved the elements and scaled Crowder’s Mountain to shoot. With a bit of creative MacGyver-ing from the photography team (and a welcome break in the storm), we were able to capture some truly beautiful shots with breathtaking views. With long days filled with outfit changes and sock swaps, dodging traffic and spotty (or torrential!) rainclouds, Array, Interloop and Sean’s team really pulled off quite an exceptional and adventure-filled shoot. It really takes a village, and we’re proud that we have the best clients and vendors in the business.